Delta V Instruments has deployed reliable technologies to advance environmental testing in many areas through our experiences. These experiences has been coupled with our appreciation for long-term relationships with our customers and vendors, allowing our dedicated staff to produce innovative burn-in solutions. Delta V has experienced and talented engineering and manufacturing personnel in many different technology disciplines. The combination of these disciplines create the most robust system or board solution. » Mechanical Fixturing – DUTs can be mounted in classic socket fashion or in many cases custom fixturing for modular devices. » Thermal Dissipation – Detailed design of DUT heat dissipation through sockets or fixtures to external heat sinks in the chamber air stream. Additional closed loop control of chamber ambient with mixed air and/or liquid intercooler technologies. » RF – Generation and detection from HF to microwave frequencies. Many of our systems exercise devices per actual in-situ environments. » High Speed Data Acquisition and DSP – Our systems utilize Analog to Digital (ADC) conversion of parameters for profile analysis and data storage. Signals can be processed in real-time to provide closed loop feedback process control. » Embedded Processing – FPGA(s) serve as the engine of our drivers supporting high speed processing and maximum reconfiguration flexibility to customer requirements. » Software - Our suite of applications accomplish full device control and monitoring. 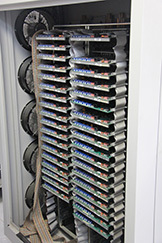 Data storage of parametric results supplies information for statistical analysis.